April 17, 2009 | After a seven-month and nationwide search, James D. Morales was selected as the new vice president of student services at Utah State University, university media relations said. The announcement came at the Board of Trustees meeting held April 10 in Champ Hall. University President Stan Albrecht informed the trustees of his decision after Morales had been to visit the campus twice in the last week. "We'll deeply miss Gary (Chambers), but James will be a valuable asset to this university," Albrecht said. Morales was born in Chihuahua, Mexico, but his family moved to southern Idaho when he was an infant. He was inspired by his older siblings to go to college, Morales said, and ended up completing one year at Brigham Young University before transferring to the University of Utah, where he finished his undergraduate degree in psychology. After his graduation, Morales was accepted into the law program at the U, but left it after one year to pursue his passion of being with and helping students, particularly those of Latino descent who, according to Morales, often overlook college as an option. "I hope to bring a new perspective to Utah State," Morales said. "I will focus on creating a welcoming atmosphere on campus, and reaching out to students of all colors and creeds to maintain the standard of inclusiveness that was established by Gary Chambers." Morales has been working in the student services field for the better part of 20 years now, and has worked at Colorado State and the University of Connecticut, where he served as the assistant director of student support services and the associate director in the Office of Admissions. Most recently, Morales has been working as the vice chancellor for enrollment and the University of Minnesota-Morris. "We couldn't be happier with James' appointment, and are pleased that our recommendation was heeded by the president," said Ross Peterson, vice president of advancement who also served as the chairman of the search committee. The announcement comes just two months before Gary Chambers, the current vice president of student services, retires after a nearly 30-year career with USU. 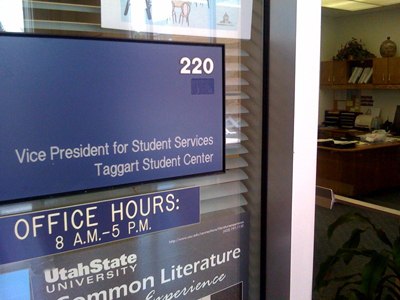 Chambers has filled roles throughout the Division of Student Services, including in admissions, the Val R. Christiensen Service Center, student government and director of student involvement. He took the helm in his current senior administrative role in 2006, according to Tiffany Evans, director of student involvement. "I am excited to join USU and will focus my efforts on engaging students from all communities, especially the underprivileged, to help them expand their opportunities."